Fly fishing in Patagonia, Argentina is the finest trout fishing in the world. When you are fly fishing in Patagonia most days you will have your choice of methods. Dry flies, streamers or nymphs will all work. In many locations you will have a choice between wading or drifting and fishing big water or small. As a result fly fishing in Patagonia is the best fly fishing in the world. Also combine that with outgoing, friendly people, great lodging, food, and wine probably makes fly fishing in Patagonia a must on everyone’s bucket list. Finally, it will be the best fly fishing trip you have ever been on. Hawkins Outfitters is hosting another fantastic trip to Argentine Patagonia. The dates are December 2 to Dec 12, 2019. You may fish all or part of this time. However you do need to stay a minimum of seven nights/six days of fishing. Dry fly fishing in Patagonia is best in December/January. This is the best time to catch large rainbows, brook trout and browns on dry flies. Trout fishing you will be best off with a six and seven weight fast action rod. The six will be your dry fly rod and the seven will handle your sink tip. It will also be you back up dry fly rod if the wind is blowing. The guides will provide dry flies and some streamers. However I always bring dries and streamers. Several streamers that we use down there are patterns I created for Michigan like the Nutcracker, Hat Trick and the Triple Double. Dry flies are Fat Alberts, PMX, and Chubby Chernobyls to name a few. The Calefu River is one of the gems of Northern Patagonia. It is only floatable early and late in the season. Mid season the water is too low. The upper reaches are pocket water with many fish to 24 inches. You are surround by beautiful rock outcroppings, it is magical! Generally we float it in two days with one night camping. Gustavo’s camps are a thing to behold. Private tents, hot showers, bathroom tents and lights strung in the trees gives you an idea of comforts provided. Finally, for added comfort the camping trip will not require that we move out of Spring Creek Lodge.Camping with Andes Drifters is as comfortable as it gets. Fabulous scenery, great camping and a terrific river combine to give you a very memorable experience. 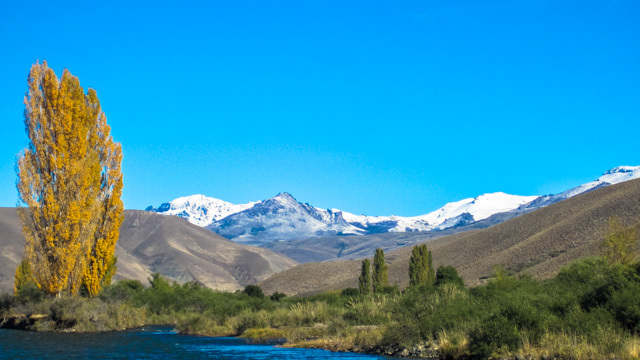 This is a minimum of 7 nights and 6 ½ days of fishing based out of Spring Creek Lodge near Junin de Los Andes. At this location we are surrounded by trout rivers and lakes that are world famous. Consequently we will access the Chimhuin, Malleo, Alumine, Lago Tromen and the Collen Cura and many other trout meccas. At the lodge there are two bedroom, one-bath villas, a central dining room and all the amenities. Couples have the villas to themselves unless they want to share a villa with others. Most of all, your stay will be memorable and comfortable. When I leave Patagonia on Dec 12th I will fly back to Buenos Aries and then fly on to Corrientes (CQN) to fish for Dorado in a new location for Gustavo and Parana on the Fly . The government of Argentina has opened up a federal area, a national park called Iberia for a maximum of three boats a day to fish for Dorado to thirty pounds in clear water. Andes Drifters, Parana on the Fly, Iberia is the only company allowed to guide in this new national park. Smaller water than the Parana and clear, this is a new destination for Gustavo and I want to see it. Accommodations, boats and guides are all first class. I have five spots open. The cost for three days of Dorado fishing, all inclusive except airfare and gratuities is $2600. Come and join me for the icing on the Argentina fishing trip! The cost for the trout portion of the trip is $5,275, all-inclusive except airfare and gratuities for 61/2 days fishing/ seven nights. You may add days on for $765/day. You may adjust the dates arriving and departing whatever days you wish as long as you have a 7 night minimum. I’m arriving Dec 2nd and departing Dec 12th, 2019. We have capacity for twelve anglers at Spring Creek Lodge. I currently have seven spots reserved on the trip. As a result I have just 4 spots at Spring Creek Lodge available. Therefore, if interested, get in touch with me quickly! Andes Drifters are our hosts and guides during this trip. First of all Gustavo and his crew are consistently the best guides I’ve used in Patagonia. They will put us in position to catch many quality trout everyday. Dries, nymphs and streamers will all be employed to capture the trout of your dreams. It is also probable, but not mandatory, that we will do one or more, overnight float trip where we camp on the river. Gustavo’s camps are a thing to behold. Private tents, hot showers, bathroom tents and lights strung in the trees gives you an idea of comforts provided. Finally, for added comfort the camping trip will not require that we move out of Spring Creek Lodge. Having traveled and fished Patagonia extensively I believe this is the finest venue and the best company to work with. As your host I will be happy to help with airlines, hotels and drivers in Buenos Aries, flies, etc. In addition here’s a packing list I’ve developed through the years. I’ll be fishing with you every day and will be happy to help then too. 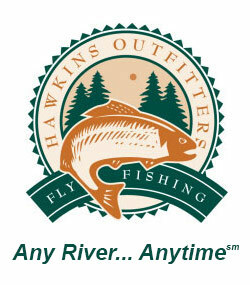 In addition to quality guides you will have a FFF Certified Fly Casting Instructor and the owner of Hawkins Outfitters at your disposal! I look forward to you joining me on this trip of a lifetime.